This product requires the base game Tom Clancy's Splinter Cell Conviction Deluxe Edition. The Insurgency Pack delivers additional content for the Deniable Ops mode that can be played solo or co-operatively. Hunt down the remaining Black Arrow insurgents across new locations in San Francisco, a New Orleans cemetery, a Portland Prison and a hidden research complex in Salt Lake City. The threat is not over; Black Arrow is still out there – watching. 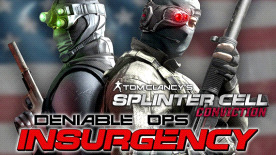 Requires the base game tom Clancy's Splinter Cell Conviction to play.